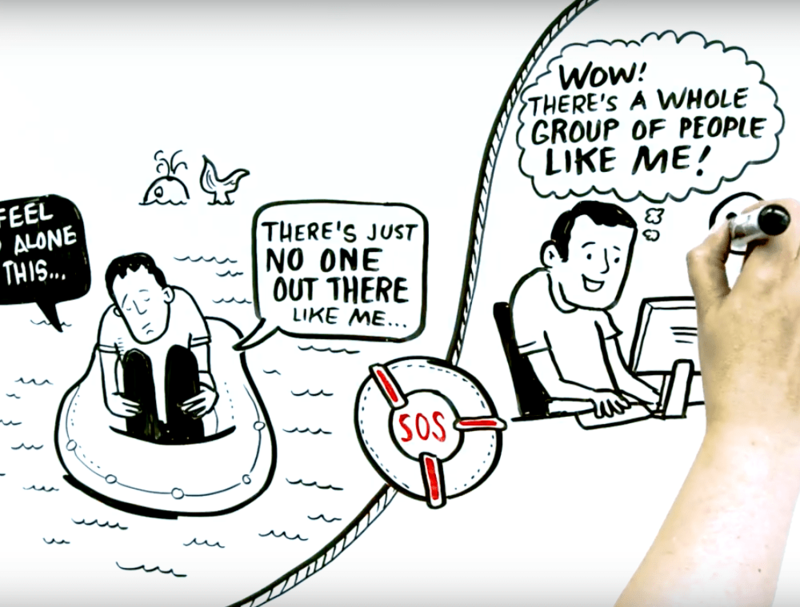 You may not know it, but you could have a superpower. When you’re sick, or even when you’re well, information and camaraderie help. And get this: research shows that a small community of people has access to better health information than most individuals alone – more up-to-date and relevant to their situation. What would you do to have yourself and your family be part of this group? The superpower that they have is what we are calling Peer to Peer Health Advice and the good news is there’s no money involved. Absolutely everyone can join. However there can be a few barriers. Today we’re going to help you overcome those barriers and get started. My name is Susannah Fox. I work to improve the health and welfare of people, most recently as the Chief Technology Officer at the U.S. Department of Health and Human Services. Think about the last time you got sick or had a significant health issue. I am guessing you probably turned to the traditional caregivers; a healthcare professional, like a doctor or nurse, or a loved one. A Pew Research survey found that seven in ten U.S. adults say they engaged their care provider last time they were sick and six in ten say they turned to a friend or a family member. However, a smaller group, about one in 4, did something different. They talked with someone who had been through a similar experience. SOURCE: “Health Online 2013” Pew Research Center, January 15, 2013. That group likely got some very useful information, especially if they were dealing with illness or injury that sticks around for a while. Peers for Progress, an advocacy organization, evaluated 20 studies of diabetes management and found 14 showing that participants in peer-to-peer health care programs lowered what’s called their HbA1c by nearly a full point. The HbA1c is a 2-3 month measurement of blood sugar and this improvement could translate into an over 35% reduction in disease in people’s kidneys, heart, or eyes. SOURCE: Prospective, randomized clinical trials such as the DCCT, the United Kingdom Prospective Diabetes Study (UKPDS), and the Kumamoto Study have demonstrated that intensive therapy aimed at lower levels of glycemia results in decreased rates of retinopathy, nephropathy, and neuropathy. Overall CV risk little more debated but recent data shows reduction. Eeg-Olafson K Diabetes & Vascular Disease Research 2016, Vol. 13(4) 268–277. It’s important to note that Peer to Peer Advice is not a new skill. I think most of us are used to engaging in peer advice for everyday situations like asking friends and neighbors about a good mechanic or who cuts their hair. Fellow moms are often experts and are a superb example of mixing practical advice with emotional support. 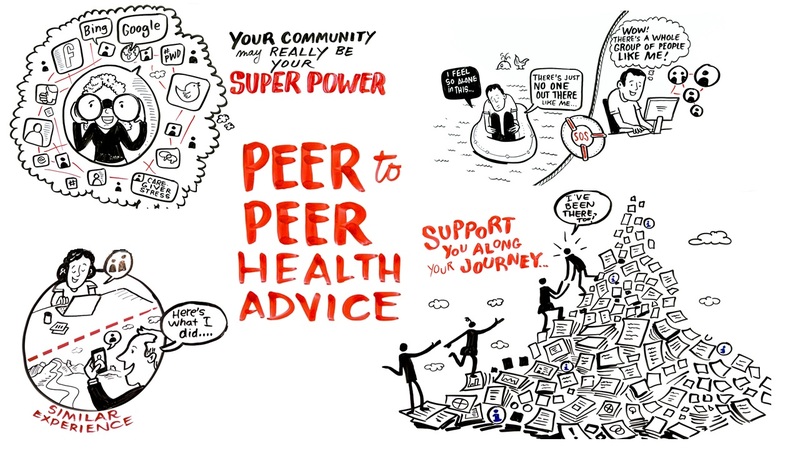 Peer to Peer Health Advice takes advantage of this same collective wisdom but also requires some special skills on your part: identifying your real questions, being honest, asking for help. These all sound simple but it can be a real challenge when it’s personal. At no other time in history have we been able to communicate across the world, in an instant, with anyone and everyone who has knowledge and experience to share. Never has it been so easy to collaborate, to compare notes, and to solve problems together. A barrier to peer advice online, and I think understandably, is fear: Fear that you won’t understand what you find – or maybe even fear of what you will find. And can you trust it? Our experience is that communities will support you regardless of your knowledge level. Most people with a new health challenge start in the same place; facing a new health concern and being intimidated by the mountain of information out there. An experienced community is uniquely qualified to support you through a long journey or even just answer a quick question. They may not know your particular challenge, but they will likely have had a similar experience. As far as misinformation online: In 2006, researchers at the University of Texas analyzed the content of an online breast cancer forum for accuracy. They found that 10 of 4,600 postings were false. But forum participants corrected seven of the misleading posts, often within a few hours. Only 3 posts containing misinformation went unchecked by the community. SOURCE: “Accuracy and self correction of information received from an internet breast cancer list: content analysis,” by Esquivel A, Meric-Bernstam F, and Bernstam EV. (British Medical Journal. 2006 Apr 22;332(7547):939-42.) NOTE: This is the most recent study of this kind that I could find. If you know of another, please let me know! Not everything you read online is true but that’s the wonderful thing about a community. You can ask and listen, learn and read, and you can always vet ideas with your doctor or nursing team. Wendy Sue Swanson is a pediatrician, author, and Chief of Digital Innovation at Seattle Children’s Hospital. I’ve collected thousands of stories from people like those breast cancer patients who started their health journey in the dark. They are people who, when cornered in the health care maze, lit a match and called out, “Is there anyone else in here?” They found a way out partly by making their own light stronger, but also by engaging the guiding light of each other. The internet isn’t magical and it is certainly capable of bias and partial information but it can also be a source of information that is open 24/7. The advice is not always life-changing, but is often life-improving. In the dark of night you may find not only a friend, but a fellow advocate and you may feel less alone. Information and camaraderie help. One common barrier is that you may believe your situation is completely unique. There is no one else like you, with your family history, your values, and your particular combination of concerns and questions. That’s true, but you also share surprising similarities with people facing the same condition. What you know may help them in unexpected ways. What they know may help you, too. And there are many forces at work here. Sure it’s advice and support but it’s also social connectedness, mentorship, navigation, and maybe just the gift of helping others. Feeling less alone, especially when fearful, ill or in pain, can be a game-changer. Erin Moore is the mother of four children, one of whom is living with Cystic Fibrosis or CF. She is a member of a Facebook group called CF Mamas, about 1,000 parents who talk online about everything from recipes to research updates. One day, Erin noticed that a mom who lives in the same city had shared that they were anxious about the effects of sedation required for her daughter’s CT scan, scheduled for later that day. Erin quickly posted a reply to let her know that her son had undergone a CT scan without sedation at the same hospital, suggesting that she at least ask about that possibility. The mom saw Erin’s note and, when she asked the clinical team, they readily agreed to try it. Thirty minutes later, the mom posted on Facebook that the scan was complete and she was on her way home with her daughter. Not sitting in recovery, not waiting for a doctor’s evaluation before discharge, but in the car, on their way home. Because of social networks, the internet, and novel communities, we are connected to each other unlike ever before in human history. SOURCE: “Creating and Sustaining Collaborative Networks in Pediatrics,” by Erin Moore. 66 Roses; June 16, 2013. Try it today: Search Facebook, Twitter, and other social media platforms for communities like “people with diabetes” (#PWD) or “caregiver stress.” Do a Google or Bing search asking what YOU want to know. Don’t worry if you don’t see something useful on your first try. It’s great just to get started thinking about how to tap into peer advice about your health. There are peers you have yet to meet and know. When it comes to your health, alongside your doctors and nurses, your community may really be your superpower. This project was supported by the Robert Wood Johnson Foundation Global Ideas Fund at CAF America. Thanks to Wendy Sue Swanson, MD, MBE, and Mike Evans, MD, for their contributions. Want to keep reading? Check out more of my essays about peer-to-peer health care or these articles in The New York Times and athenainsight. Or explore the stories and evidence collected in this Wakelet. If you have a question or comment, please join the conversation on this post: When it comes to health, your community may be your superpower.